Franklin Barbecue's reputation proceeds itself -- it's Texas Monthly's top BBQ joint, commands a 3+hr wait, and now, thanks to a cocktail bar in Austin, is capable of intoxicating more than just your taste buds. You maniacs! 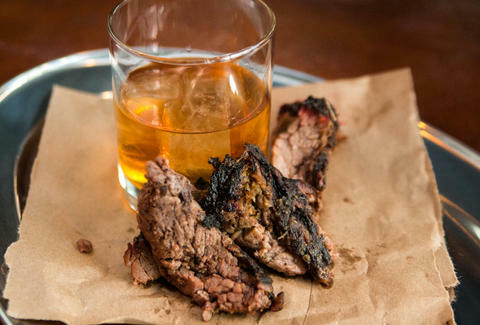 You went and infused whiskey with Franklin Barbecue brisket!! And didn't even call it briskey!!! 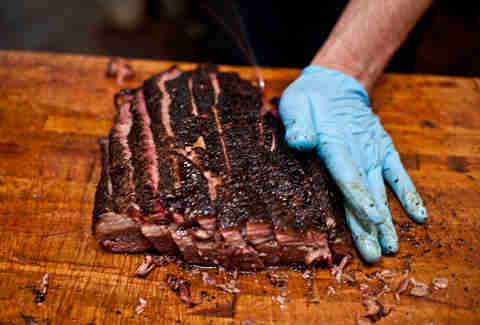 It all starts with this: salt-and-pepper-rubbed brisket cooked low and slow over post oak for nearly 16hrs, resulting in a beef so soft and juicy that Bon Appetit called it the best in the nation. 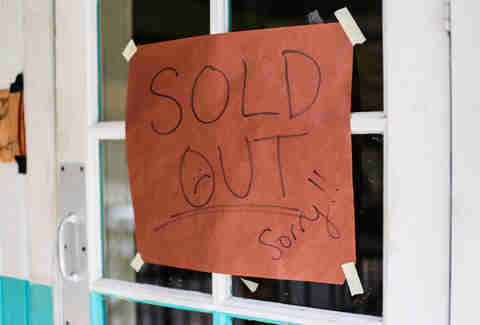 If you show up at Franklin's anytime after 10a, you'll likely be out of luck on grabbing any, which is why it's a damn good thing someone's putting it into bourbon. Yes, 10a. 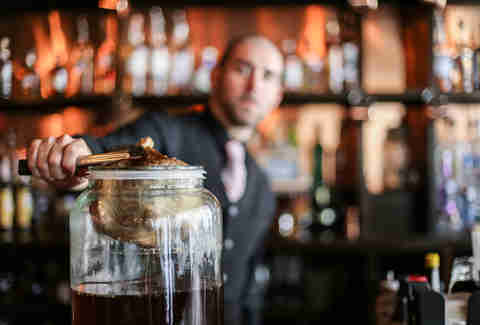 Thankfully, Austin's CU-29 opens at 4p, and they'll be infusing six-liter batches of a mystery bourbon with two pounds of Franklin's moist for over a month before freezing it, removing the fat, and straining it into what must be the happiest jug in the world. 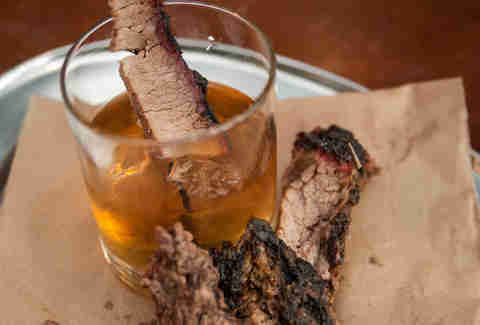 The finished product, with a brisket garnish to boot. It tastes like meat, but in the best possible way. "You get the classic bourbon flavors of caramel, oak, and spice on the front end, but then the finish has the depth and smokiness of the BBQ flavor," the CU-29 crew says. "Since it's hitting both your front and back taste buds, it really wakes up your entire mouth." They suggest that you drink the fat-washed goodness neat, so basically the opposite of what most people look like after they eat just the brisket.